The holidays are in full swing, and you are probably getting a few more houseguests than you are used to. The first thing people see when they pull up to your home or business is your landscaping. Think of your landscaping as your property’s first impression. During the holidays, you want your landscaping to reflect the warmth and joy that is created within your home. Blooms Landcare is here to offer some fun and unique ideas to bring holiday cheer to your landscaping. There is nothing that says, “I’m a Grinch!” more than not having any lights on your home during the holidays. 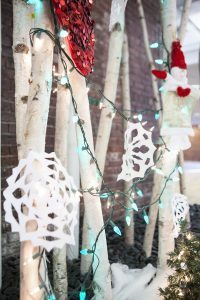 Even just a few strategically placed strands of lights can turn your home into a magical winter wonderland that will be the envy of your neighbors. Try to create a plan for your lights before putting them up. Organized colors and patterns can help your home or business look clean and put together. If you hate the work of putting lights up and taking them down, call a professional lighting company to help. A dirty landscape full of leaves and sticks is not very merry. Keep your landscaping clean and trimmed during the holidays. A manicured landscape is sure to impress, even with minimal lighting. The holidays are the one time of year when neighbors drive around and inspect your landscaping. Don’t be that neighbor with the ugly yard. Add giant red bows to shrubbery around your entrance. These large weatherproof bows and ribbons are incredibly affordable and create a joyous, almost toy-like atmosphere. If you would like help in bringing holiday cheer to your home or business landscaping, contact the experts at Blooms Landcare. Call (817) 688-5352 to schedule your professional landscaping today.